Based in the North East and with operations across the UK, Metnor Construction works hard to address the ever-concerning skills gap affecting its industry. It is estimated that the construction industry must recruit 400,000 people each year until 2021 in order to keep up with the country’s housing and infrastructure needs. But with 35 per cent of careers advisers believing a career in construction is unattractive – and two in five parents stating they wouldn’t encourage their children to join the industry – the stigma is proving difficult to shift. A testament to Metnor’s support system can be seen with head of operations, Lee Kirk, recently winning ‘Mentor of the Year’ at the 2018 Generation4Change awards, in association with Constructing Excellence North East. Lee, who has been with the company for nearly five years, recognises that it is the people who are the driving force of the company. Currently, Metnor supports ten per cent of its workforce through a personal development plan. To help close the gap and do its part in reducing the skills shortage, Metnor Construction aims to engage with the local community that surrounds each of its projects, demonstrating the different careers available when working as a management contractor such as Metnor. This is crucial to changing people’s opinions towards the construction industry. Engaging children in activities is also a great opportunity to showcase the construction industry. In January, Metnor Construction hosted a workshop with Alton First School in Hampshire. 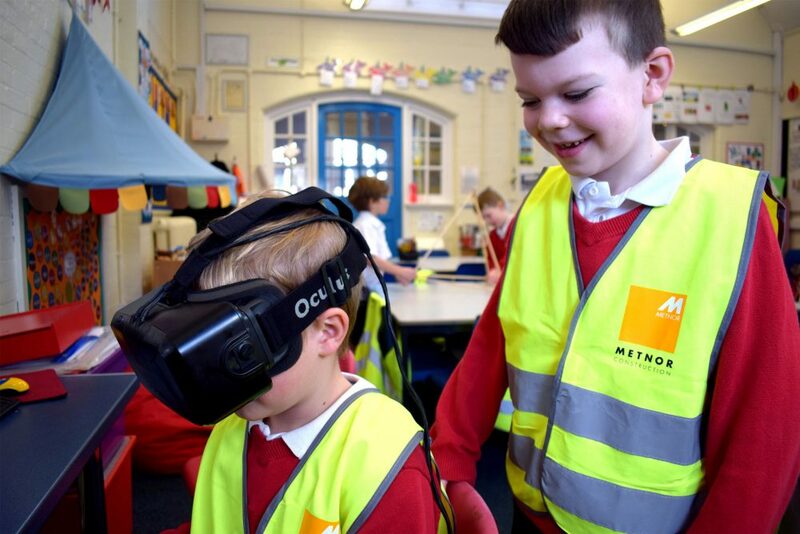 Located just one mile from the company’s £20million sports centre for Everyone Active, it was able to demonstrate the latest technology in BIM (Building Information Modelling) through Virtual Reality Goggles. Closer to home, its recently completed Backworth Park Primary School hosted site visits throughout the build, class workshops and collaboration with the client at Northumberland Estates to organise extracurricular school trips. While Metnor actively looks for young people and apprentices to support its growth, the team also understands that to shift the stigma, work must be done with those at a much younger age too. There are many schemes out there where learning is disjointed, with apprentices doing several unconnected tasks for different companies. Metnor Construction’s primary aim within apprenticeship schemes is to provide continuity. It designs a long-term tailored development plan, which is in line with the apprentices’ individual career goals. Developing good habits early and inspiring young people at Metnor to set goals for themselves encourages independent learning and self-motivation.